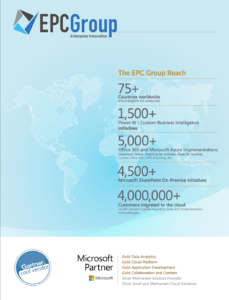 EPC Group is a recognized industry leader in developing and implementing governance strategies for our clients around SharePoint 2019, Office 365 and SharePoint Online as well as the technologies with which they integrate such as Microsoft Exchange, Skype For Business 2013/2016 and Project Server. EPC Group’s governance strategies also cover custom development, code promotion and application lifecycle management (ALM). Governance is a key component to ensure long-term success and is unique for every organization. Our governance strategies define who will manage the overall platform and related granular roles and responsibilities within your organization to establish rules for its appropriate usage. Our detailed strategies outline how the business and technical users leverage the environment with a careful balance of required restrictions and enterprise compliance policies and well-defined procedures for growth and future change. EPC Group’s strategies have been developed over the past 20 years to ensure your organization’s governance plan covers nearly any and all scenarios you may experience throughout the platforms lifecycle. One of the major elements that sets EPC Group apart from our competitors is the way in which we implement a successful SharePoint 2019 governance strategy, in a manner and mindset that reflects “operational governance”, as we configure the underlying platform and its configuration to enforce governance and its related policies.